"The day has come! First I want to thank you wonderfull Lori, the amazing hostess of the Party. of the possibility to take part of this fun. Then i want to thank my dear Mags, who has made this known to uss Finns beaders (or at least for me :D). And of course many thanks to my lovely partner Sandra. You can see other participants of the 3rd reveal of the 7th Bead Soup Blog Party here. When Sandra picked up her soup, she didn´t know from which country her partner is. The soup was full of snow, ice and starry night! It´s like the winter in Finlad. That was funny. By these beads I can tell you about the beauty of the winter in Finland. :) Here you can see what Sandra sent to me. And when I started to make jewellery of these beads, it was winter, full of snow. 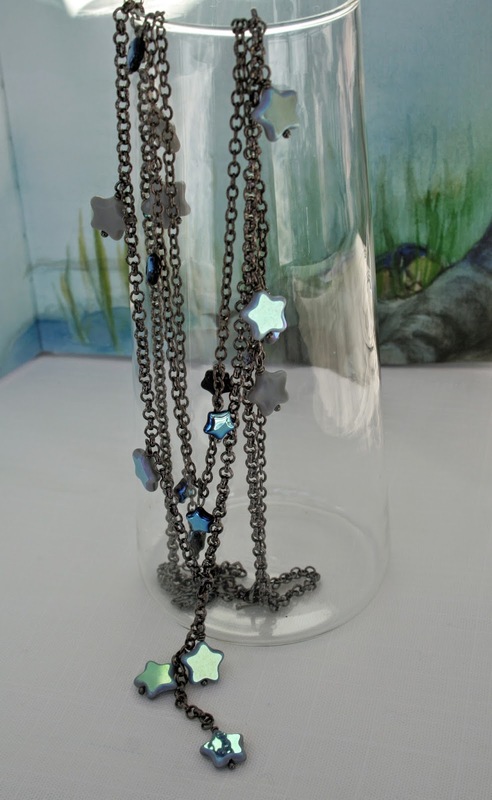 The first necklace is made from Sandra´s beautiful quartz crystals; like icicles, opalite glass beads, the cute metal moon pendant and the star clasp and littele metal stars. The chain and the middle size opalite beads and some small facetted agate are my own. 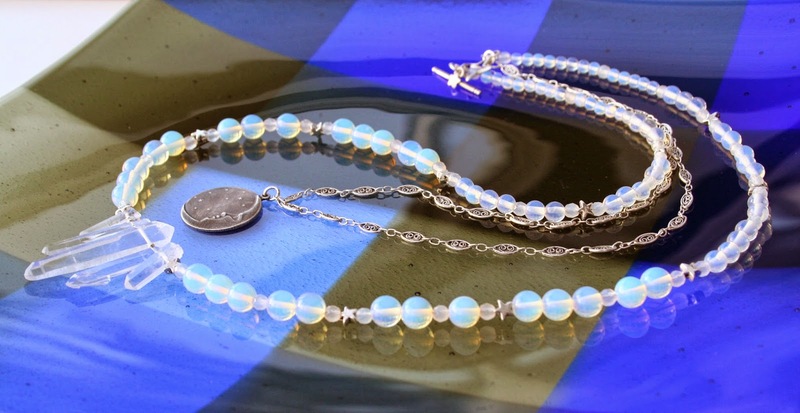 Only now I realized the beauty of opalite beads. 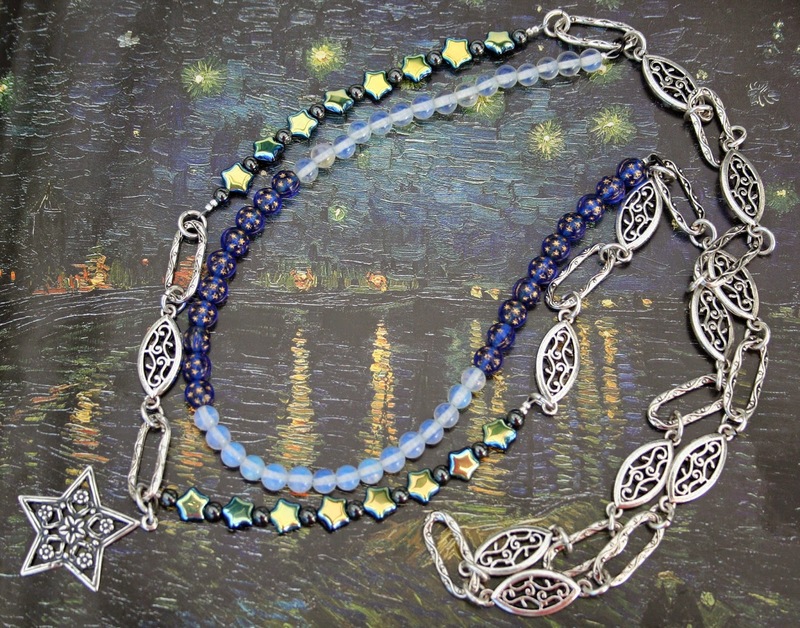 When I looked at those beads, the shimmering snowy scenery in the moon light came into my mind. 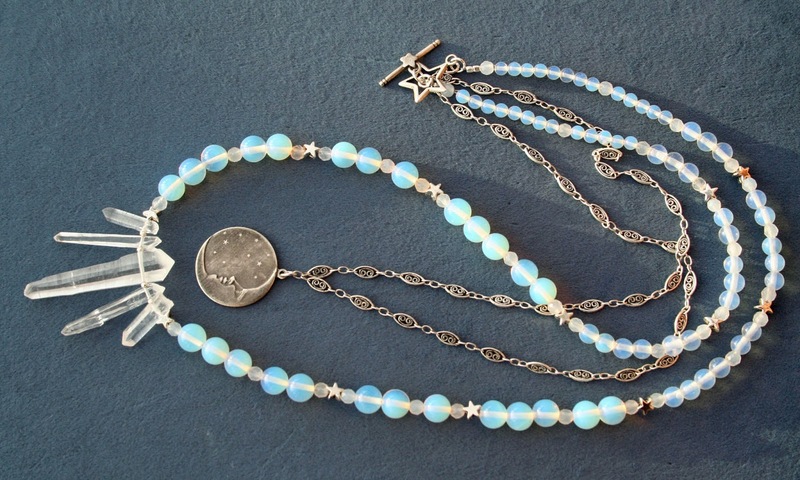 The name of the neclace is the Icy moon shadow. The long necklace is made from Sandra´s unique Chech beads. In the bigger beads the other side of the beads are like mirror, and the smaller one´s the other side is dark and the other side brighly glittering blue. The gun metal colour chain is my own. Maybe I´ll add some beads more, because I still have them a lot. Let the name be Only stars. 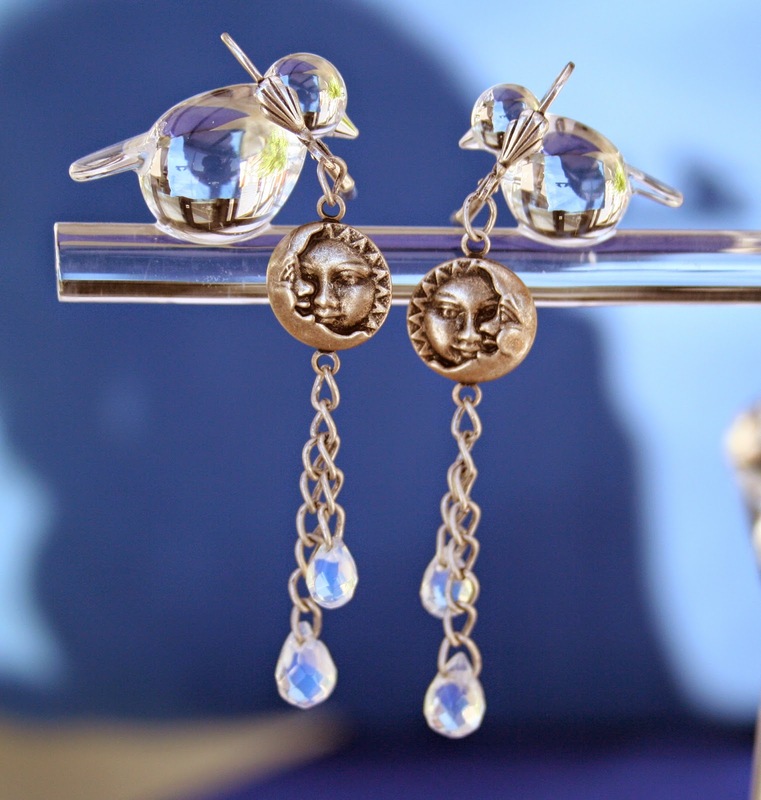 The earrings with Sandra´s beautiful opalite briolettes and small Czech star beads are made of Sandra´s cute metal components. The chains are my own. 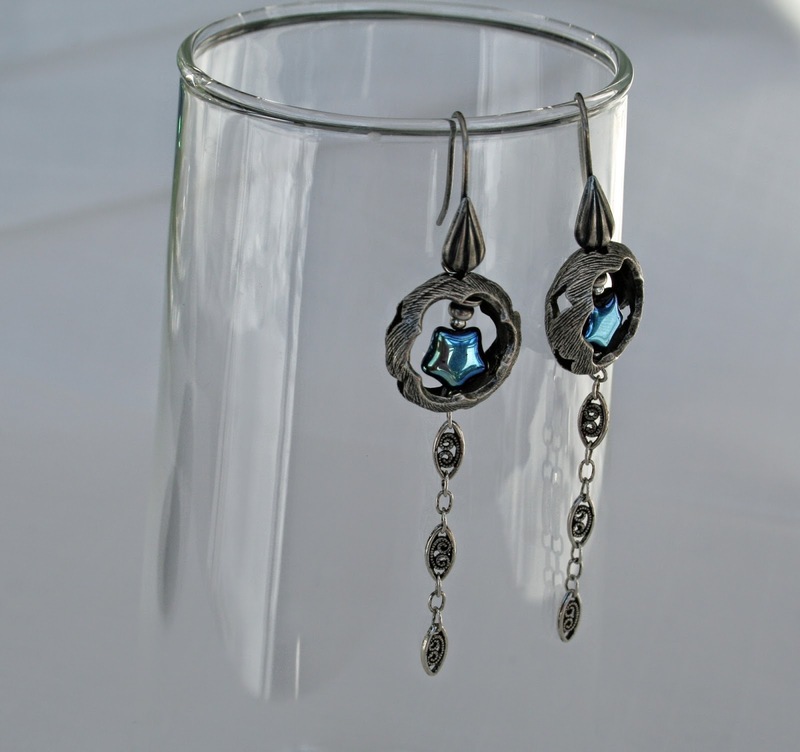 Let the first earrings be The twins and the other ones Shooting stars. Starry Night Over the Rhone (September 1888) is one of the Vincent van Gogh´s paintings. The next jewellery is inspired of by that painting, or... was it actually contrarwice? Yes it was. First i made this necklace and then i remembered teh painting. But in any case the name of it is - of course - Starry night. 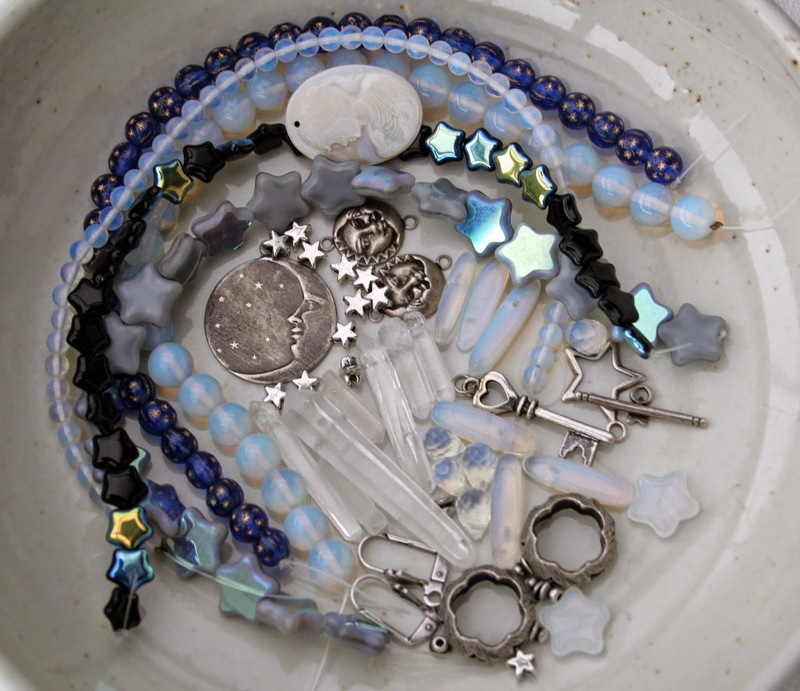 Tis necklace is made from different kind of sandra´s Chech star beads, some opalite beads, and metal stuff is mine. 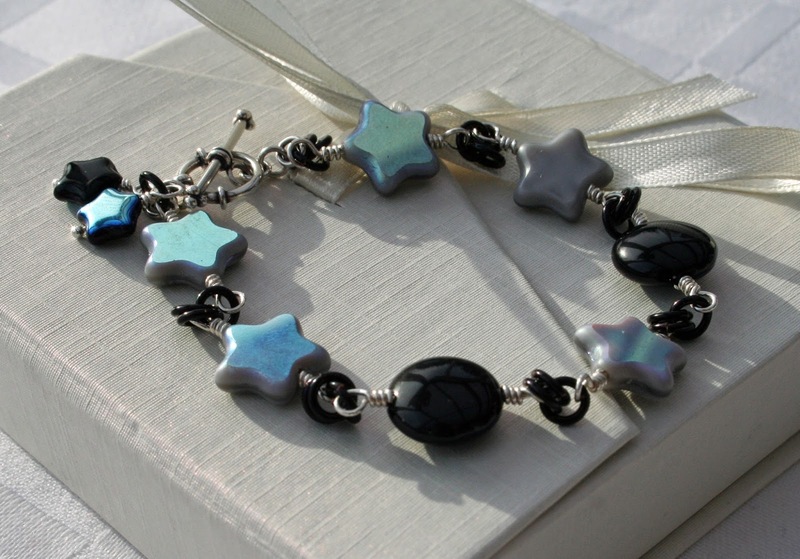 The other side of these small stars are very dark blue, almost black. The name of the bracelet is Rock star, because i tried to make it a little bit `rocky´. The last two month were cold. The spring has had to wait unusually long time. But it came by small steps. There was lot of snow on the ground when I made this necklace, but the snow melted almost in eyes, in one week, when it was raining a lot and when the weather got warmer. The name of this necklace is Miss spring, I miss you. The spring is like a young girl; so sensitive and beautiful. I like this shell pendant Sandra sent to me. 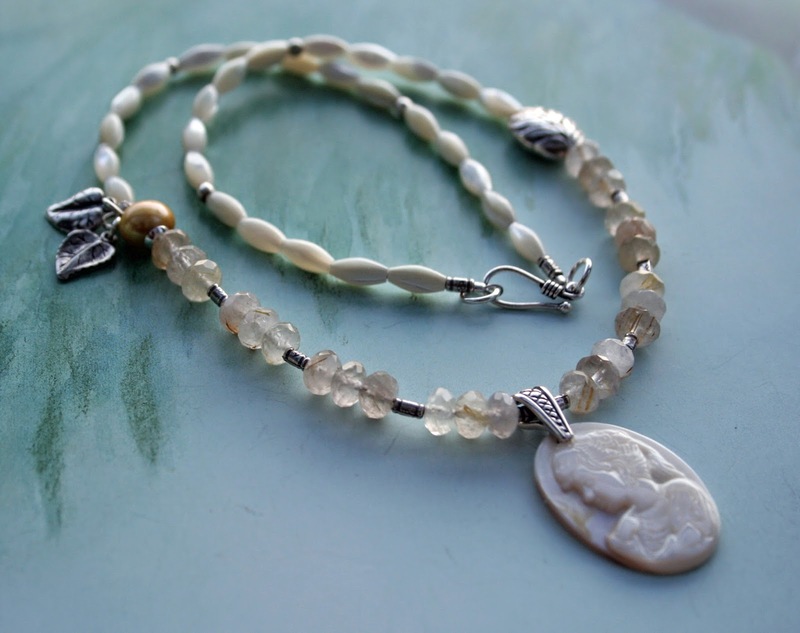 I made the necklace with the pendant from Bali silver, rutile quartz and small shell beads, and one freshwater bead. :) this is wey small and light on the neck, and that´s why wey nice to use. 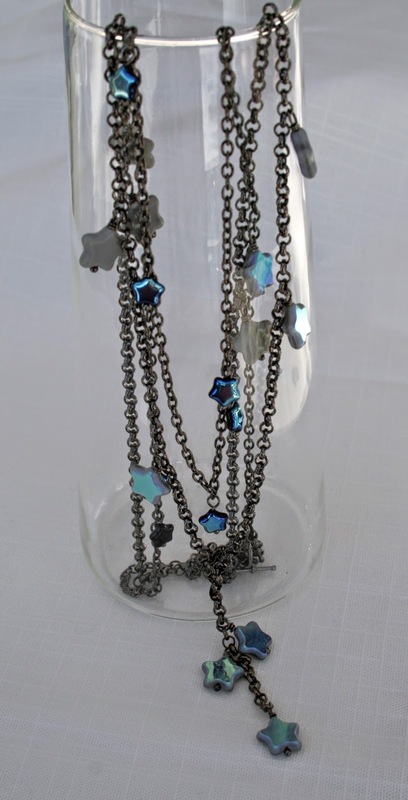 Eventually this necklace became my favourite and i have used it many times.